Your 65” 4K LED TV looks amazing in your living room. Astonishing resolution, accentuates your furniture, everything about it is mind-blowingly incredible, except for one thing- the built-in speakers. Your obvious next purchase is a surround sound system, complete with an AV receiver and booming subwoofer. A Home Theater Sound System worthy of your behemoth of a TV will require a lot of components, taking up quite a bit of space and money and involving a complicated setup that you are not ready to commit to. Is there anything else you can do?! Alas, a soundbar is the solution to all of your problems! (Well, your sound system problems at least) A soundbar is a simple speaker that is usually powered and self-amplified and can be placed just below your TV. Soundbars can recreate that surround sound effect by utilizing an acoustic design and targeting the sound and bouncing it off the walls in your living area. Soundbars boast obvious benefits regarding convenience, placement and price since the are no worries of complicated installation and wiring or component costs. **Disclaimer: Soundbars only create virtual surround sound effects, merely simulating the true experience of a proper 5.1 surround sound system. If you have the means, opt for a proper home theater system instead. If you don’t have the means, a soundbar is a great alternative, especially to your built-in TV speakers. #1 What’s in the box? A soundbar is considerably wider than it is tall and is usually a single speaker. These long and narrow speakers are generally around the length of your TV. Soundbars are traditionally wide stereo speakers and contain an array of speaker drivers. The width of the soundbar is responsible for creating the “simulated” surround sound effects of a classic home theater system. Soundbars are often self-amplified where the amplifier is built directly into the speaker itself. In these instances, power cables will be included. A decent soundbar will probably include a subwoofer, which is connected to the main speaker either wirelessly or by using wires. If the subwoofer connects wirelessly, it can be placed out of the way (like underneath some furniture) if you have a power socket nearby to plug it into to. Ideally, a small display on the system will help adjust the volume and among other levels. Having a remote is also ideal to adjust these settings. If you choose a soundbar that doesn’t have a remote, you will instead be relying on your TV or Blu-ray player to set volume levels. When perusing a soundbar selection, take note of a few things. Know where you plan on placing the soundbar before you purchase one. If it’s going underneath your TV, make sure the soundbar isn’t too tall and blocks your TV’s sensor. Also make sure there is enough room on your TV stand for the speaker to sit, otherwise you may want to consider wall mounting it. Take measurements of your space beforehand, like the length, width and depth of your TV and stand, so you are prepared. Nothing is worse then getting your awesome new system home and realizing it won’t work with your existing setup. Soundbars come in all different shapes and sizes though so don’t panic, there is one out there that will work for you. 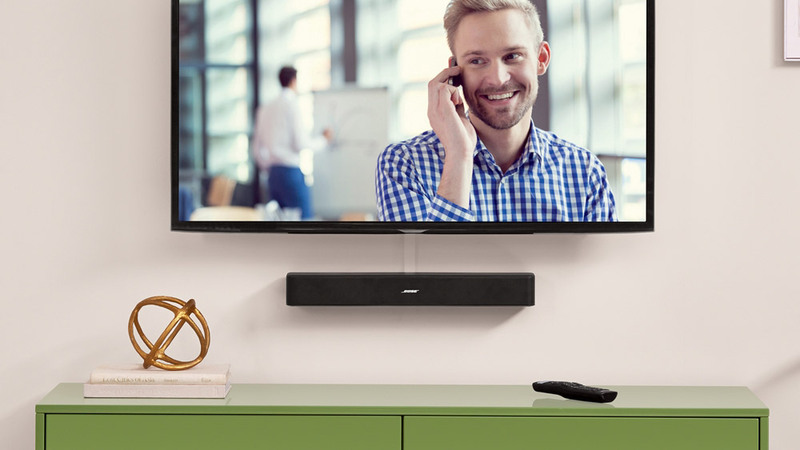 A soundbar that has Bluetooth connectivity allows you to play music directly from your smartphone or tablet. You can also stream music from your computer! The most attractive part about this feature is that pairing your soundbar with your audio devices is relatively easy. Other connectivity options include HDMI, RCA and 3.5mm stereo. If you plan on using your soundbar with an AV receiver, an HDMI cable will be useful. If you simply want to connect the soundbar to your TV, a standard audio cable will do the trick. An active soundbar describes an all-in-one setup where the speakers, amplifiers and the processing components are all contained in one system. This yields a simplified setup and a streamlined look. Passive soundbars require external amplification so you’ll need an amplifier or AV receiver that will be connected by speaker wires. Passive soundbars require a more involved setup but the end result is a crisper sound and the capability to connect to more sources. In this new age of audio equipment, a vast majority of soundbars will be active, but there are instances where you can find passive soundbars. If you’re seeking an intense, deep hum to get that full move theater effect from your sound system, a subwoofer can make all the difference. A subwoofer is an extra piece of equipment, separate from your soundbar. As opposed to older models, the newer, updated subwoofers are discreet and sleek. Some soundbars come with a subwoofer in the box, while some may require you to purchase one separately. Wireless subwoofer options make the setup process painless and simple. If you want your favorite action films to boom, consider adding the bass. If you are in the market for a soundbar, know these five important factors before you start shopping. First, know what a soundbar is and what it is not. It is an alternate option, not a perfect replacement, for a traditional surround sound system; however, soundbars can deliver an incredible audio experience if you’re upgrading from built-in TV speakers. Second, know where you want your soundbar to be placed and how much room you have to put it there. Third, know how your soundbar will need to connect to your TV and about its Bluetooth capability. Fourth, determine if you want an active or passive soundbar and weigh the pros and cons, though most soundbars you’ll find will be active. Fifth, decide if the addition of a subwoofer is a necessity for you and consider models that already come with one.